"We are very happy with our pool and all of the interactions we have had with Dal Pino people (from design, through construction, to maintenance) have been smooth and pleasant." "Jerri and I selected Dal Pino pools based on design, Dal Pino’s reputation and recommendations from previous Dal Pino customers. We were not disappointed. From the design phase to closeout, the management of the project was exceptional. The pool and spa were completed on time and on budget." "I couldn’t be more happy." Our courtyard display area will give you an idea of the endless possibilities for your new Dal Pino Quality Pool. You will be able to see the finished product and how the various materials look after they are installed. The soothing sound of running water adds to a relaxing atmosphere that can transport you to another realm. Natural Rock Waterfalls can help create a natural feel to your backyard environment and can be designed in a range of styles. Swimming and even spelunking in your own, private Grotto! Your hideaway Grotto provides a sense of adventure and surprise within a hidden retreat. A Sun Shelf is a unique design feature that lends itself to various uses by adults and children alike. You can lounge on it to tan, it can be a shallow play area for young children, and it’s also the perfect place for an umbrella, a chair and a cool drink! Swim-up Seating is a fun addition to your pool. Really, what’s more decadent than swimming up to your own, personal bar any time you want? Swim-up seating can be added for adults, or even as an area where kids and adults can enjoy a snack, or simply a place to relax in the pool & socialize. 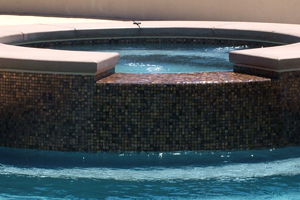 Stacked stones lend rustic and distinctive feel to your Dal Pino Quality Pool. The ascending and descending stones give a very strong yet elegant look and feel to your landscape. Rather than the standard white pool lighting, upgrade your lights to include several different colors, all of which can be controlled by your pool’s computer system. Explore the dramatic effects that different light colors have on your pool or spa at night! Fire pits can be flush with the deck or raised. They offer a gathering place on cool nights to sit and visit. Adding fire bowls gives a romantic and exotic twist to your personal paradise. Integrate these with a water feature and you have the elegance of water and fire any time! Bubbler features offer a vertical surprise of cascading water that can be installed on most Caribbean ledges and benches. These features offer fun for your kids and create an fascinating visual appeal to your back yard escape. Sheer Descents can produce a wide range of water effects to suit any design. Sheer Rain, Sheer Descent and Sheer Curtain waterfalls are available with different finishes to match your fascia material. Laminar Jets produce a clear arc of water as they gently enter any pool or spa. 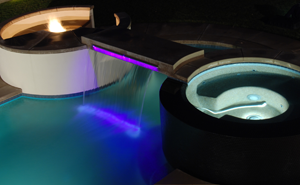 Add the pizzazz of LED laminar lighting to sync with your colored pool or spa lighting. Rock Waterlines are a beautiful solution to maintaining a pure, organic feel to your backyard landscape. If your yard is surrounded by nature, rock waterlines are the best way to keep Mother Nature’s look safe and sound. Swim your way into the sunset! A vanishing edge, also known as an infinity edge, helps the pool meld into the surrounding landscape and can especially highlight an incredible view.